We told you we’ve been working hard! A new report from the Secretary of State’s Office shows that for every person who registered with the GOP since March, the Democrats registered more than three. These numbers correlate with our sense on the ground: Arizona Democrats are more energized this year than Republicans and that may translate to victories in races that, in any other year, they could not win. However, the GOP still makes up nearly 35 percent of registered voters in the state, versus less than 31 percent for Democrats. Independents, those not affiliated with any of the four recognized parties, make up about a third of registered voters in the latest count, though the share of Independents in the total is dropping. “I think the latest partisan registration numbers are yet the most recent tangible evidence that the energy of the 2018 election is on the center-left of the political spectrum,” said Republican consultant Stan Barnes. Barnes said he has never seen such energy among that group in his 30 years as a Republican. That’s a really significant concession, given that Barnes, a former state lawmaker, was around when Democrat Janet Napolitano got elected governor in 2002 despite the fact the GOP had 125,000 more registered voters in the state. Democrat Tom O’Halleran is hoping to hang onto the seat he won two years ago after incumbent Democrat Ann Kirkpatrick made an ill-fated run to oust U.S. Senator John McCain. Steve Smith, Wendy Rogers and Tiffany Shedd are all vying to be the GOP nominee. The number of Republican voters in the sprawling district that stretches from the state’s northern border to its eastern edge and down into suburban Tucson is virtually the same now as it was two years ago. But while Democrats have 22,000 more registered voters, the number of Democrats actually is down by about 7,000 from 2016. In Coconino County, total voter registration is down by nearly 16,000 voters from January to August, with Democrats losing 4618 voters and Republicans losing 2630. It seems likely that many voters have moved without changing their voter registration. 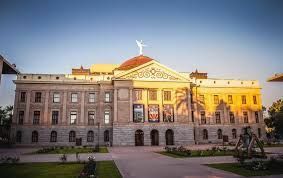 And, according to a lawsuit filed this week, that may not be the voters’ fault — Arizona’s Republican Secretary of State has been violating the federal Motor-Voter Law. That violation may affect half a million voters in Arizona. We are redoubling our efforts between now and October 9 to make sure that every eligible voter in the county is registered and ready to vote. When registration for the August 28 primary election closed, there were 75,583 registered voters in Coconino County. 40.3% of those were Democrats, 25.9% were Republicans, and 32.30% were not registered with any of the four official parties (aka “Independents”). Posted in Latest News and tagged ACLU, Voter Registration.